Scottsboro is one of the Yellowhammer state’s most stunning cities; a place where business, leisure and family values go hand in hand. It’s no wonder that when people make their home here, they stay for their lifetime. Why not when we have attractions like the Scottsboro-Jackson Heritage Center, once the home of the renowned Proctor family, now a fascinating history museum and Goose Pond Colony, located on Lake Guntersville’s banks. This resort is home to two 18-hole golf courses, marina, beach, campground, lodge and full-service restaurant. Don’t forget Scottsboro’s famous Unclaimed Baggage Center, which draws people from miles around with more than 7,000 new and pre-owned items. Scottsboro enjoys a hot summer season, often with high humidity and though we don’t get much snowfall, the winter days can be chilly. So you need to make sure you have hot air when you need it and cool air when you don’t. Although All Seasons Heating and Air is based in Alabama’s Albertville, you don’t need to worry if you need help in your Scottsboro home. We have on-call service technicians in your town, and they are available as and when you need them. If your HVAC system has let you down, we are right there to bring the southern comfort back to your home as quickly as possible. Here at All Seasons, we provide heating, ventilation and air conditioning (HVAC) repair, replacement, service and new installation for your home's comfort system. 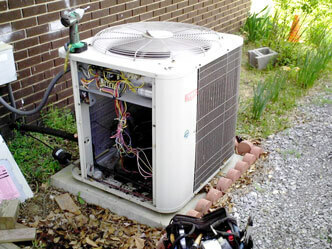 Fast, 24-hour emergency service is crucial when your heating and/or air conditioning system unexpectedly breaks down. Our experience in the industry ensures your HVAC project or service will be done right. Central Air and Central Gas: You may notice that some rooms in your home are too cold or some are too hot. This is a sign that your HVAC system is not operating properly. This could be because of failing equipment, ductwork issues or inadequate insulation. Thermostats: If no one is home for most of the day, you may want to consider installing a programmable thermostat so you can save money when you are at work or while you are sleeping. Consider having one installed before you leave for your vacation. The average cost per unit is around $120, which is well worth the savings you will make on your energy consumption throughout the year. Air Handler: This component is responsible for the movement of cool air through the air ducts in your home. It will need a regular inspection and lubrication, it may also require cleaning. 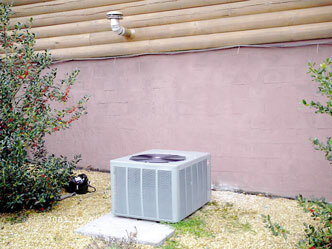 Filter Replacement: Dirty filters will smother your HVAC’s efficiency. Having them replaced regularly will prevent a build-up of mold, allergens and dust throughout your home. 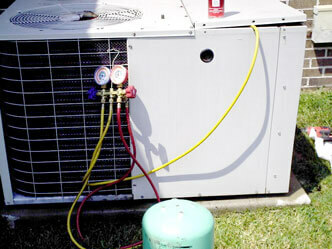 Refrigerant: Low refrigerant levels prevent your HVAC system from running efficiently. You may need the Freon levels topping up. If there is a leak in the coils these can easily be repaired. System Tune Ups and Maintenance: To keep your comfort system in tip-top condition you will need to schedule regular maintenance checks. We can take care of that for you and remind you when you are due for your next tune-up. New System Installation: Perhaps your HVAC system has given up the ghost or maybe it’s over a decade old and your home comfort is being compromised by its lack of efficiency. If this is the case, it’s a good time to call our team and have it evaluated. If it is beyond repair or too costly to fix, you may want to consider replacing it with a unit that has the ENERGY STAR rating. Replacing you current HVAC system with ENERGY STAR equipment can reduce your energy bill by up to $200 dollars per year. It’s easy to take your home comfort system for granted. We all do it. In fact, you often don’t even think about it until it’s not working properly. Your HVAC system is working hard year-round to keep you and your family content. But when it breaks down, it can be exasperating, not to mention expensive. You may not even be financially prepared for it when it happens. This is one of the reasons that scheduled services are crucial. As well as improving the performance of your system, they can reduce your annual energy bill by up to 30 percent. What’s more, you can nip any issue in the bud before it becomes an unpleasant surprise. So you can stay on top of your HVAC system health, All Seasons Heating & Cooling offers a program designed specially to help you. Our Energy Savings Club Memberships offers free scheduled maintenance and discounted repairs in case of a breakdown. Your Energy Savings Club Membership gets you priority service. Our technicians will arrive on time and in clean uniforms, they will cover their shoes, lay down mats that will keep all work areas clean. When they are done, they always make sure to leave the area clean and tidy. $67 Diagnostic Services: If your system breaks down, you always pay a discounted rate no matter what time of the day or week it is. Two Super Tune-Ups Each Year: We will keep your system running at peak performance. Priority Service: On the hottest days or coldest nights, when our phones don't stop ringing, you’ll go to the front of the line. Extended Appointment Times: We don't make you work around our schedule, we work around yours. We’ve been in the business long enough to know what our customers want and what they expect, and that’s exactly what we offer, guaranteed. 100% satisfaction guarantee: If you’re not completely satisfied, we will work things out until you are. Installation and Workmanship Guarantee: All services and components are guaranteed free from workmanship defects. Better Than We Found It Guarantee: You can rest assured that when our technicians leave your home, your HVAC system will be running much better than it was when they arrived. Lowest Price Guarantee: We promise that you won’t find our products or services at a lower price anywhere. Same Day Service Guarantee: If you need to see our technicians today, they will be there to service your system. All of our employees are Seal of Safety Certified. What this means for us is that they have passed a thorough drug test and a criminal background check. This shows our commitment to protecting the wellbeing of our clients and their families. How often have you opened your door to a service repairman and felt uncomfortable, perhaps even unsafe when he is in your home? What our Seal of Safety Certification means for you is you can rest assured that you, your family and your personal possessions are absolutely safe when you invite our technicians into your home. All Seasons Heating and Air has been supplying heating, ventilation and air conditioning services to the Marshall, Jackson and DeKalb counties for more than 35 years. 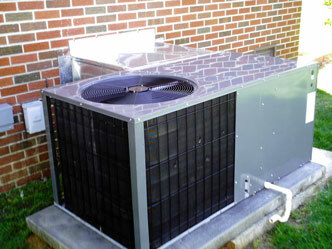 We install, service and repair all brands and models of HVAC. We are proud of our conscientious workforce, who will take care of your home and provide a stress-free service. Our Scottsboro, AL heating and air conditioning technicians are professionally trained and equipped with the necessary tools and knowledge to give you the most prompt and effective heating and air conditioning repairs. From cost-saving air conditioner maintenance to heater repair, you can count on our technicians for all your heating and air conditioning service needs. Contact us today to see how we can help you in Scottsboro, AL.